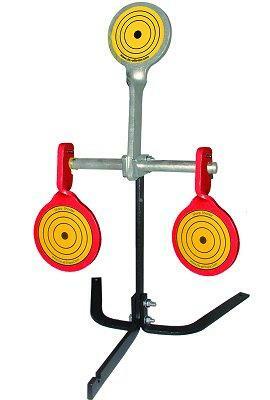 Sharpshooter targets are made of powder-coated, high grade steel and engineered for years of durability and enjoyment. These high quality targets have a twisted one-piece design to eliminate weld breakage. No setup or walking downrange to reset; just reload and have fun. Sharpshooter spinner, 22 Cal spinner; bullet force spins target over attachment bar and back to the set position. Paintball spinner, paintball force spins target over attachment bar and back to the set position. 22 Cal and paintball auto reset target; bullet force spins the target to a catch bar above. To reset, simply shoot the reset target, or each individual target. 38-44 and 9mm-3006 Cal auto reset target, bullet force spins the target to a catch bar above. To reset, simply shoot the reset target, or each individual target. Airgun, auto reset target, the force of the pellet spins the target into an upright position. To reset, simply shoot the reset target, or each individual target. Paper target stand, middle and top cross bar 1/4", top, bottom and back support legs 3/8", high grade steel. Targets, tie straps and paper clips furnished.